The Premier League top four chasers Arsenal are considering a summer swoop for Ligue 1 star Gelson Martins, according to the latest reports. The winger is currently on loan at Leonardo Jardim’s AS Monaco from the Spanish giants Atletico Madrid and has caught the eye of Gunners after making a superb start to his time in France. 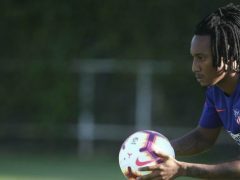 Gelson has three goals and three assists in his first eight matches, and seems to have finally found his form at Les Monegasques after a difficult spell in Madrid. A Portuguese sports newspaper A Bola claim the Gunners are monitoring the star again after failing in a bid to land the 23-year-old attacker on loan in January window. Be the first to comment on "Deal Almost Agreed: Arsenal reignite interest in making a summer swoop for Ligue 1 star"